The “Holiday Coast” of Kwazulu Natal is a 130km sub-tropical paradise of beaches, coastal forest & sunny days and one of the most popular travel and holiday destinations in South Africa and therefore named “The Holiday Coast” of Kwazulu Natal. The area stretches from Umkomaas, south to Margate and Port Edward, and inland to Kokstad. This malaria free area is full of holiday towns, offering a host of accommodation on the South Coast of Kwazulu Natal and explore adventure self-drive day tours. Accommodation in Margate. Margate, the holiday centre of the KZN South Coast where all the action is in-season or out-of-season. Its long, sandy beach made safe by shark nets and a force of permanent, professional lifesavers must rate as one of the most photographed stretches of coastline in the Republic. Near the main beach there’s a lovely children’s pool plus a freshwater Olympic pool. Accommodation in Ramsgate. Ramsgate Beach with Blue Flag status offers a quiet family beach for a pleasant day out. Protected by off-shore nets and lifesavers in attendance seven days a week, beachgoers to Ramsgate are also protected when the wind blows from the north. The main beach features a tidal pool known as the Noel Quarry Pool, a tranquil lagoon, changerooms, on-beach parking and a shady, grassed, sheltered area equipped with braai and picnic facilities. There are pleasure pedal boats and recreational activities on offer. Restaurants on the beach and there is a whale-watching deck opposite the beach. 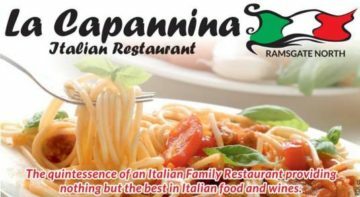 Restaurant of the month - La Capannina - Ramsgate North - Phone 039 317 1078 for the weekly specials. The quintessence of an Italian Family Restaurant providing nothing but the best in Italian food and wines. Accommodation in Uvongo. Uvongo is one of the prettiest spots on the Lower South Coast of KwaZulu-Natal, sheltered position and the natural waterfall. Life guards are on duty and the beach is shark netted. Lovely swimming beach, fishing pier and fishing spots, a nature reserve, beautiful scenery, snorkeling, body boarding, surfing & jogging. Accommodation in Shelly Beach. Renowned for its excellent rock and surf fishing, Shelly Beach boasts the largest ski boat base between Durban and East London and plays host to numerous deep sea angling competitions throughout the year. This popular ski boat launching site is a favourite for fishing, dolphin and whale watching excursions and divers who head to the world-renowned scuba diving reef destination, Protea Banks. Accommodation in Port Edward. Port Edward offers a wealth of fun with swimming area, favourite fishing spots for anglers & one of the best ski-boat launch sites on the South Coast. life guards are present on weekends and holiday periods. Accommodation in Marina Beach. Marina Beach boasts Blue Flag Status with top facilities, wheelchair friendly and lifeguards on duty throughout the year, ample parking and a restaurant. Beautiful sandy beach and tidal pool. Also a firm favourite with kite surfers. Accommodation in Southport. Southport Beach is a popular and safe beach all year round and offers wonderful dolphin and whale watching opportunities. Milkwood trees shade the braai areas, sandy beach with rock pools and a tidal pool. Safe guarded car park, clean ablutions, life guards. Southport Beach was recently given its prized Blue Flag Status. Accommodation in Hibberdene. Hibberdene’s main beach seems designed for sun-bathing & relaxing, as well as a safe. Main Beach Lifesavers patrol and control the beach. The beach ablutions are clean and tidy. During season, there is usually someone manning the beach kiosk for that snack or cold drink. The beach is a stone’s throw from shops and refreshments. The wide stretch of shoreline offers interesting rock pools. The beach is next to the estuary of the river that provides an ideal stretch of water for the kids to paddle upstream on. The main beach at Hibberdene is not the only one, popular though it is. Hibberdene Beach has pilot Blue Flag Status and provides delightful shaded family picnic spots. What to Do, Where to Eat, Where to Shop, Adventure & Sport, Entertainment, ideal destination for Holiday or Business visits. South Coast Accommodation in KZN with options of Self Catering Accommodation, Beachfront Pet Friendly Holiday accommodation, B&B – Bed & Breakfast, Guest Houses, Hotels & Camping on our Holiday Coast. Water activities are a major attraction; Surfing, swimming, fishing, snorkeling, whale watching and annual sardine run. Deep Sea Fishing & Shore Fishing, Scuba Diving. Coastal Towns (North to South); Umkomaas, Clansthal, Scottburgh, Park Rynie, Pennington, Bazley Beach, Ifafa Beach, Mtwalume, Hibberdene, Pumula, Umzumbe, Sunwich Port, Southport, Sea Park, Umtentweni, Port Shepstone, Oribi Gorge, Harding, Kokstad, Oslo Beach, Shelly Beach, St Michaels, Uvongo, Manaba Beach, Margate, Ramsgate, Southbroom, Marina Beach, San Lameer, Trafalgar, Munster, Glenmore, Palm Beach, Leisure Bay & Port Edward.